CLE Kindergarten 1 offers an introduction to basic concepts of learning. Your 4- to 5-year old can enjoy short periods of pre-reading activities a few times a week. As he matures, the frequency and duration of these lessons can gradually increase. Basic notes and essential answers are included in the work-books. CLE’s Kindergarten 1 introduces basic concepts of learning. The five LittleLight workbooks introduce listening skills, matching, identifying eight primary colors, coloring, tracing, counting, and more. The optional teacher’s guide gives detailed lesson instructions, including extra activities in motor skills, Bible memory, songs, and stories. Reproduction of student pages with answers are included. Separate Answer Keys are not available. The goal of CLE Kindergarten 2 is introduction to sounds and numbers, but not necessarily mastery. Workbooks and Activity Books are done simultaneously—a lesson from each per day. 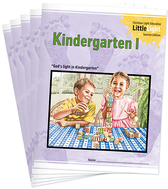 Kindergarten II has five LittleLight Workbooks. They specifically prepare students to use CLE’s Learning to Read program, but can be used as preparation for any reading program. The workbooks introduce the concepts of sounds, letters and numbers, recognizing and writing numbers 1-100, and more. The five LittleLight Activity Books provide fun matching activities, dot-to-dot, color names and coloring, cutting and pasting, listening skills identifying, and more. 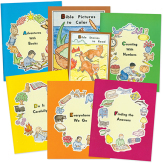 These six workbooks and one softcover Bible story book are designed to prepare children for first grade. In the ABC Readiness Series, children practice skills essential to a successful start in learning to read. The ABC Readiness Series provides the four- or five-year-old with short periods of pre-reading activities a few times per week. As he matures, you can gradually increase the frequency and duration of these lessons. You will sense when he is ready for more structured learning. By carefully watching the child's progress, you can tailor his work so that he is neither pushed too early nor held back too long, so that you have neither a frustrated nor an unchallenged student. This set provides learning activities such as distinguishing colors and shapes, cutting and pasting, listening to Bible stories and answering questions, recognizing the numbers from 1 to 10, forming letters correctly, tracing, following directions, writing their own names, and hearing initial consonant sounds. This series follows the ABC Readiness Series. The basic purposes are the same in both series: helping parents give constructive guidance to each child prior to entering first grade, and helping children appreciate and increase interest and knowledge in the world around them. This series gives further practice with the same basic visual, auditory, mental, oral, and motor skills as the preceding series. Simple directions are given in coloring, tracing, writing, drawing, counting, matching, cutting, and pasting. The books in the series are generally used in alphabetical sequence and basically have the same level of difficulty. However, each book is self-contained and may be done in any order according to the child's needs.